The key theme of travel is all about experiencing new things and meeting new people. We visit different cities and locations around the world to see things we’re not used to and learn about different ways of life. Staying in a hostel helps to enhance the travel experience in so many ways, providing a friendly atmosphere and comfortable surroundings for people to come together and share their stories and ideas. Hostels offer so many advantages over other forms of accommodation, especially for young people, with communal spaces like game rooms, lounges, and kitchens providing the perfect backdrop for new friendships to form. Lots of students and young people from all around the world go traveling around Europe, so there are plenty of hostels in European capitals and major cities. Copenhagen is a great example. The capital of Denmark is a beautiful city, renowned for its open-air art features, Amalienborg palace, colorful architecture, scenic harbor, Tivoli Gardens amusement park, Christiansborg Palace, Rosenborg Castle, and many other landmarks and attractions. There’s a lot to see and love in Copenhagen, and plenty of hostels to provide comfortable beds and communal spaces in which to engage with other travelers and learn more about the local area. Lots of people go on backpacking trips all around Europe, with hostels providing a smart and simple place to rest your head in the evenings and get going on new adventures the very next day. These no-frills, stress-free locations offer affordable room rates and dozens of cool services and amenities like free breakfasts, internet access, discounted attraction tickets, shuttles to local airports, and more. If you’re looking to stay in a Copenhagen hostel, check out the locations listed below. 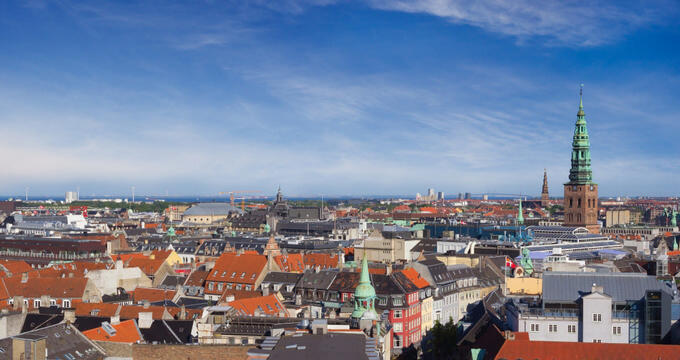 Offering stunning views of the port of Copenhagen in a towering building, the Danhostel Copenhagen City is one of the Danish capital's top hostel locations. It's only 10 minutes away from several of the city's top spots like the Tivoli Gardens park and the main shopping district. Friendly staff can be found on-site at all hours of the day and night and will organize special events and walking tours of the city. This hostel also comes fitted with a cafe, bar, kitchen area, laundry room, and more. A free breakfast buffet is provided, along with high speed internet access, and both private and shared rooms can be reserved. Part of the popular Generator line of hostels, which can be found in many major cities all around Europe, Generator's Copenhagen location is just a short walk away from some of the city's hottest spots like the Nyhavn nightlife district and the famous Little Mermaid sculpture. This is a simple but efficient hostel with colorful, clean, cozy rooms in both mixed and single-gender varieties. Wi-Fi and comfortable linen are provided free of charge to all guests, and anyone staying at this hotel can also make the most of the on-site amenities like game room, lounge area, terrace, and all-day bar. Located in the trendy Vesterbro district, this Copenhagen hostel is only a short walk from the city's main train station and right by the popular Tivoli Gardens theme park too. Rooms are decorated in a youthful, urban style with graffiti motifs on the walls and colorful decoration throughout the building, with features both mixed and female-only dormitories for anywhere from 4 to 10 people. Private bathrooms are included in each room and Wi-Fi is provided free of charge for all guests. A laundry room, kitchen, bar, cinema area, and even a tattoo parlor are all also located right on-site, giving you a lot of different ways to spend your down time. Right by the picturesque Sankt Jorgens Lake, Steel House is one of the most modern and stylish hostels in all of Copenhagen. Inspired by old factories and office buildings, the deco in this place has an industrial theme that young people and travelers will simply adore. Steel House features both mixed-gender and female-only dorms with comfortable, private pod beds and secure storage lockers. Private rooms can also be reserved, with the pricier rooms coming with their own terrace areas. On-site amenities at this affordable Copenhagen hostel include an indoor pool, bar, fitness center, lounge, and laundry room.